Apple has introduced a new system for controlling the way files are opened in Snow Leopard, and some users are very upset about it. “Apple has made a huge, dumb mistake,” says Ross Carter, a developer whose application, Pagehand, is affected by the change. What’s changed is the use of Creator Codes to identify the app that a particular file should be opened with. Creator Codes are stored in a file’s resource fork. They are little four-character strings that tell the computer what to do with the file concerned. They’ve been around for years, but a lot of people considered them better than alternative systems that specifically linked file extensions to applications. Previously, if I created a text file in TextEdit, it would always open in TextEdit when I double-clicked it in the Finder; even if I had many other text editing applications installed. How has this changed in Snow Leopard? In Snow Leopard, the Creator Codes are still there – but the OS completely ignores them. Instead, it now uses the Launch Services database to see which app has been assigned which filetype. So if your computer has been told to open all HTML files in Safari, it will do so – even if they are HTML files you hand-coded yourself in a text editor. Ross Carter is particularly annoyed about this. His word processor app, Pagehand, saves files as PDFs. In Leopard, there’s no problem re-opening them with a double-click in the Finder, because the Creator Code tells the system to open them in Pagehand, the app that created them. So how might this affect the likes of you and me? Well, it’s only going to impact your workflow if you commonly use two or more apps for the same kind of file. If you always, always read and edit plain text files in one text editor, no problem. 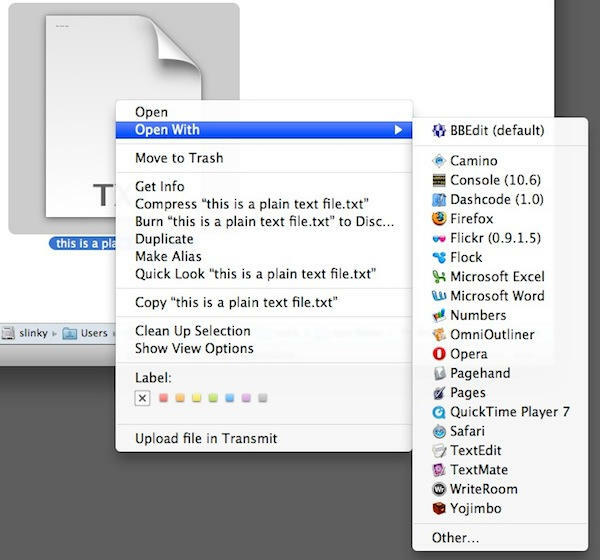 But if you’d prefer some rich text documents to open in TextEdit and others to open in Word or Pages; well, you’re going to have to change the way you work a little. It’s worth noting that some of the comments on Carter’s post and on the TidBITS article are very positive, with several people saying they always wished things had worked this way.